What is the TRANSPOSE Function? The TRANSPOSE function is categorized under Lookup and Reference functionsFunctionsList of the most important Excel functions for financial analysts. This cheat sheet covers 100s of functions that are critical to know as an Excel analyst. It will flip the direction of a given range or array. The function will convert a horizontal range into a vertical range and vice versa. In financial analysis, the TRANSPOSE function is useful in arranging data in our desired format. The array argument is a range of cells. The transposition of an array is created by using the first row of the array as the first column of the new array, the second row of the array as the second column of the new array, and so on. Type the function in the first cell of the range, and press CTRL-SHIFT-Enter. 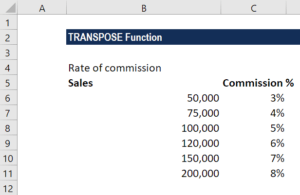 How to use the TRANSPOSE Function in Excel? Next is to enter the range of the cells that we want to transpose. In this example, we want to transpose cells from A2 to B8. Finally, we will press CTRL+SHIFT+ENTER. When an array is transposed, the first row is used as the first column of the new array, the second row is used as the second column, and so on. As mentioned above, we need to enter the TRANSPOSE function as an array formula that contains the same number of cells as the array using Control + Shift + Enter. For a one-off conversion, we can use Paste Special > TRANSPOSE.